Weekly Income Webinar Replay - Trading Concepts, Inc.	Weekly Income Webinar Replay - Trading Concepts, Inc. PLUS:...I want to give you a Special Training Session in which I show you How to Trade a Small Account for maximum profitability! ​You'll get Unlimited LIFETIME Access into your 24/7 Members Area to the recorded online class ​within15 minutes of enrolling! 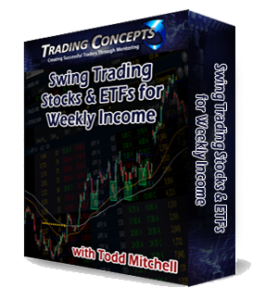 BONUS: Receive a 2 Hour Q & A Session along with More Powerful Insights into Swing Trading Stocks & ETF's for Weekly Income! Have a fantastic day and ​I look forward to seeing you inside!. Like most new traders I started off losing consistently. I got smart and I knew I had to get some professional trading education. So I shopped around, found Todd's course, and I bought it. Overnight, Todd took me from being a consistently losing trader to consistently making money. I am now trading full-time! Rip N.
I love the way you teach. The repetition of your methods do work and is very easy to follow. I look forward to making more profitable trades. Thank you so much! Karen S.
Thank you SO much for this course, I've been enjoying your teaching style a lot. These past two weeks of trading since I've started studying your MFAM principles have been the best ones of my entire trading career! Pam G.
I've made a killing with those 3 bar patterns you showed, especially coupled with those powerful 123 patterns!!! I don't make a lot of trades, but the ones I make are all rule based. Thanks for everything Todd. Stanley D.
I want to tell you that your course has provided me with the knowledge and confidence needed to move forward. Al B.